United Russia may have obtained a technical victory in Sunday’s disputed parliamentary elections, but their failure to obtain 50% of the votes has imparted serious psychological damage on the ruling elite. It has also emboldened the public, which for the first time in a long time realises it can make a difference. These developments makes yesterday's result extremely significant, writes Grigorii Golosov. The Russian election results have been a surprise for many, and especially for the leaders of United Russia, President Medvedev and Prime Minister (soon to be President) Putin. At the time of writing, it was clear that United Russia’s share of the vote would not reach 50%. In the last elections it had 64.3%. But a result being unexpected does not make it important. So is this one important? If you look at the situation in Russia in terms of normal democratic politics, United Russia’s poll would not be considered a defeat. It has lost its command of two thirds of parliamentary seats – what is known in Russia as a ‘constitutional’ majority, since it allowed the party to change the constitution as it wished. It must be said, however, that United Russia has no particular need of this absolute majority. The constitution adopted by Russia in 1993 after Yeltsin’s defeat of parliament granted the President such enormous powers and limited those of parliament to such an extent that Putin must find it ideal as it is. The only alteration that could be useful to him has already been made: the presidential term of office has been increased from four years to six. But United Russia has retained a simple majority, making it as before the executive’s only power base. If United Russia indeed end up a few seats short of a simple majority, this will not change much. The only three other parties to be represented in parliament will be those who also had seats before the elections: the Communist Party (which has won about 20% of the vote), A Just Russia and the so-called Liberal Democratic Party of Russia. These parties are also to a greater or lesser extent under the control of the executive, and some MPs from the last two have always aligned themselves more with the Presidential administration than their own party leaders. For example, when a few days ago a group of MPs submitted a request to the government to investigate the activities of GOLOS, an independent election monitoring group, one of the signatories represented United Russia, and two others A Just Russia and LDPR. The first of these is led by Sergey Mironov, whose rise to a federal level political career he owes completely to Putin, and the second is led by Vladimir Zhirinovsky, who is known for his ability to come to an agreement with the Kremlin on any question of any importance. And the credentials of the Communist Party as an opposition force are also rather dubious. At the same time, the conjecture that United Russia might not obtain even a simple majority was a somewhat fantastic one. The Russian electoral system, based as it is on the administrative mobilisation of voters and large scale falsification, cannot by definition produce such a result. At the start of its election campaign United Russia announced that it was aiming for 65% of the vote. Such a result would be logical in the context of an authoritarian regime, where the role played by parliamentary elections is pretty insignificant. In countries of this type elections fulfil a number of functions, all of them secondary. And one of the most important is what is known as a ‘signalling’ function. In other words, election results are supposed to signal to both the rest of the world and the country’s own population that the regime’s political position is rock solid. That it enjoys almost universal support – not even because its rule is effective (this is not essential), but because there is no alternative. ‘Opposition’ parties are positioned to repel, rather than attract, the voters. This was the game Russia’s rulers tried to play this time as well, but they lost, because Russian voters refused to play by these rules. 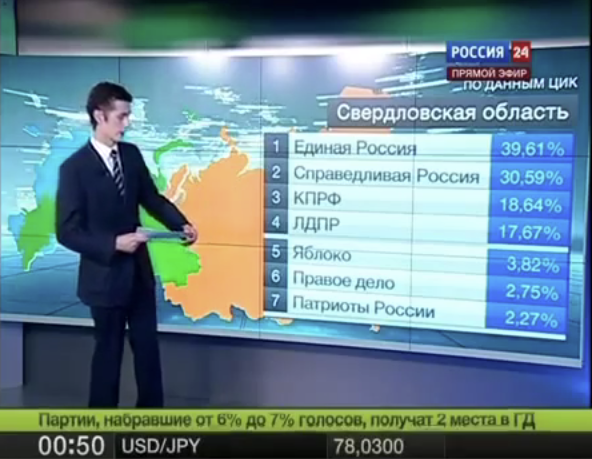 Throughout the entire election campaign Russia’s Internet media (the only part of the media not completely under government control) conducted a campaign urging Russians to vote for any party other than United Russia. Of course one shouldn’t exaggerate the influence of the Internet in Russia. Suffice it to say that on election day, 4th December, the main liberal internet media - the websites of the Kommersant newspaper, the New Times journal and the Ekho Moskvy radio station and the influential Slon.ru site - were off line after attacks from unknown hackers. But this campaign evidently had a longer term effect: it was able to evoke a response from a significant number of voters because it reflected their own political mood. Voting for other parties, despite their obvious flaws, became a much more general phenomenon than in 2007. The government was not expecting this. But it happened. United Russia has suffered serious psychological damage, which significantly outweighs its technical victory. In the first place, the big cities withdrew their support – not only Moscow and St Petersburg, but Novosibirsk, Yekaterinburg and many others. In the second, it lost the support of regions with an ethnic Russian population: its biggest successes were in areas with a concentration of ethnic minority groups. A reputation as a provincial and un-Russian party is not the best of reputations. But the most important thing is that the myth of United Russia’s omnipotence, its ability to wipe the floor with its opponents, has been comprehensively exploded. The elections did send a signal, as they were expected to. But the message was not the one expected by the country’s rulers. For the first time in a long period of authoritarian government, the public realised that it could make a difference. And that is an important result.